Keep up on the issues affecting us. Take action to make your voice heard. Know of additional news items? send them via email. Over 1.5 million march for immigrant rights in one of the largest days of protest in U.S. history. Mass demonstrations were held across the nation on May 1st. In addition to marches, millions of immigrant workers participated in a boycott of work and commerce, showing their importance to the U.S. economy and underscoring the negative impact this legislation would have on businesses throughout the nation. Democracy Now’s Amy Goodman covers highlights of some who spoke at rallies. Jesse Jackson, in an editorial in the Chicago Sun Times, eloquently describes how immigrant rights have ignited the entire movement for social justice and how global corporations, not immigrants, are where we should be directing our job-loss frustrations. "The answer isn't cleaning up immigration, but electing leaders who will challenge the corporate hold over our trade policies." Read more on Common Dreams. Over 350,000 marchers mobilized in New York City last Saturday around a series of issues including calls to end the war in Iraq, refuse any attack on Iran and to support the rights and dignity of all people, including immigrants and women. Saturday’s march was notable for its high participation of antiwar activists in the trade union movement, uniting the biggest antiwar labor contingent in US history. Organizers also put together “Issue tents” highlighting the key issues of the wide-ranging March coalition: the war in Iraq and threats of war and U.S. nuclear attacks on Iran, a Palestine tent featuring Q&A on Israel/Palestine and folkloric dance in an Arab-style “café,” counter-recruitment campaigners and a Labor tent featuring the NYC Labor Chorus. For more coverage of the event, visit the United for Peace and Justice web site and read an account by Tom Englehart. Take Action: United for Peace & Justice has some great suggestions in order to keep the pressure on Congress to sign legislation against the war. They can also help you uncover the specifics on whether your Representative has supported any legislation to end the Iraq war. It was three years ago Monday that President Bush proudly declared mission accomplished and major combat operations over. Meanwhile the U.S. death toll in Iraq has topped 2,400. 70 soldiers died in April making it the deadliest month for U.S. troops so far this year. “Think Progress” also has a list entitled “Mission accomplished: by the numbers”, documenting just how far off target the administration is in accomplishing their mission. It lists the number of Americans and killed or wounded in the Iraq war as well as the numbers of insurgents and costs to taxpayers. Also, wince-worthy is a transcript, provided by Media Matters, of the toothless press coverage of the event by Chris Matthews of MSNBC’s Hardball. In “Mission Accomplished: A look back at the media's fawning coverage of Bush's premature declaration of victory in Iraq”, Media Matters discusses the media love-fest over Bush’s photo-op entrance aboard the aircraft carrier USS Abraham Lincoln. Take Action: The Media Matters article includes contact information for the fawning journalists. Let them know what you think of their coverage. Bush has quietly claimed the authority to disobey more than 750 laws enacted since he took office, reports a major investigation by the Boston Globe. The president has issued so-called "signing statements" that assert that he has the power to set aside any statute passed by Congress when it conflicts with his interpretation of the Constitution. According to the Globe, Bush has issued a signing statement to more than one of every 10 bills he has signed. Bush has said he can ignore Congress' ban on torture as well as Congressional oversight of the Patriot Act. Bush has also said he can ignore laws forbidding US troops from engaging in combat in Colombia and any attempt by Congress to oversee what happens in military prisons such as Abu Ghraib. NYU law professor David Golove has warned that Bush's actions threaten to overturn the existing structures of constitutional law. Golove said that having a president who ignores the court, backed by a Congress that is unwilling to challenge him can make the Constitution simply ''disappear." 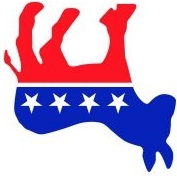 Response from Democrats on the hill? A whopping three Democrats have spoken out against the president’s claim to constitutional immunity. "The Bush-Cheney administration has cultivated an insidious brand of unilateralism that regularly crosses into an arrogance of power," Said Senator Patrick Leahy of Vermont in a statement. "The scope of the administration's assertions of power is stunning, and it is chilling." The other two Democrats who also spoke out are Harry Reid of Nevada and Edward M. Kennedy, Democrat of Massachusetts. Take Action: Contact your representative and senators and demand that they stand up for the Constitution. See also the People for the American Way web site to sign a petition against another attempt at a power grab by the Bush administration. Critics of the administration position say that altering the conventional understanding between the press and government could have dire consequences. The Independent of London reports the war in Iraq is set to become more expensive in real terms than Vietnam. The U.S. is now spending about $6 billion a month in Iraq. Columbia University economist Joseph Stiglitz estimates the ultimate cost of the war could top two trillion dollars. Take Action: Help filmmaker Robert Greenwald with his new film, Iraq For Sale: The War Profiteers. He is aiming for a release date shortly before the November elections and needs financial support. Read why you should donate and how $50 will get your name in the credits. In true Edward R. Murrow style, Colbert pulled one of the most honest, lambasting speeches in the midst of the lion’s den at the annual White House Correspondent’s Dinner. A blistering comedy "tribute" to President Bush by Comedy Central's faux talk show host Stephen Colbert at the White House Correspondent Dinner Saturday night left George and Laura Bush unsmiling at its close. “I stand by this man. I stand by this man because he stands for things. Not only for things, he has stood on things. Things like aircraft carriers and rubble and recently flooded city squares. And that sends a strong message, that no matter what happens to America, she will always rebound with the most powerfully staged photo ops in the world." Take Action: Send a message thanking Stephen for his steadfast courage and wit in addressing the arrogance of the president and passiveness of the press on the Thank You Stephen Colbert web site. Let the media know what you think about Colbert's performance. Write a letter to your favorite newspaper, send and email or call a station. Media contact info on the Congress.org web site. 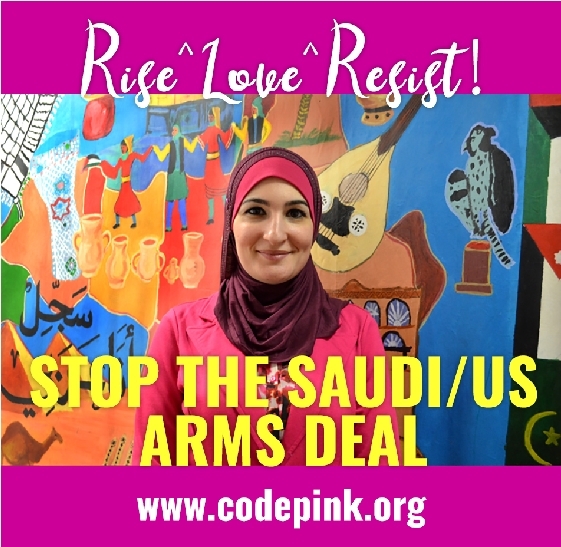 CodePink is making plans for Mother's Day with a Call for Peace 24 hour vigil in Washington, D.C., May 13-14. The vigil will start at 3pm on Saturday and continue to the same time on Sunday. Cindy Sheehan and Susan Sarandon will be there as well as singers, writers, and moms, children and grandmothers. Take Action: Tell your friends and family in the U.S. See the CodePink web site for details on how to participate from afar, including a letter writing campaign to Laura Bush. And Working For Change has a way for you to send a rose to the mothers of the fallen. Organic roses will be presented to the mothers and tied to the fence outside the White House as a memorial to the dead and a call for peace. If you know of additional news items that should be listed, send them via email. Our Eyes Wide Open Film Series is suspended; for further information click here. To learn how to stop the DNC from delivering us another Trump, read Autopsy: the Democratic Party in Crisis. Photo of a school in Yemen bombed by Saudi Arabian jets supplied by the U.S. and fueled in the air by the U.S. Air Force. 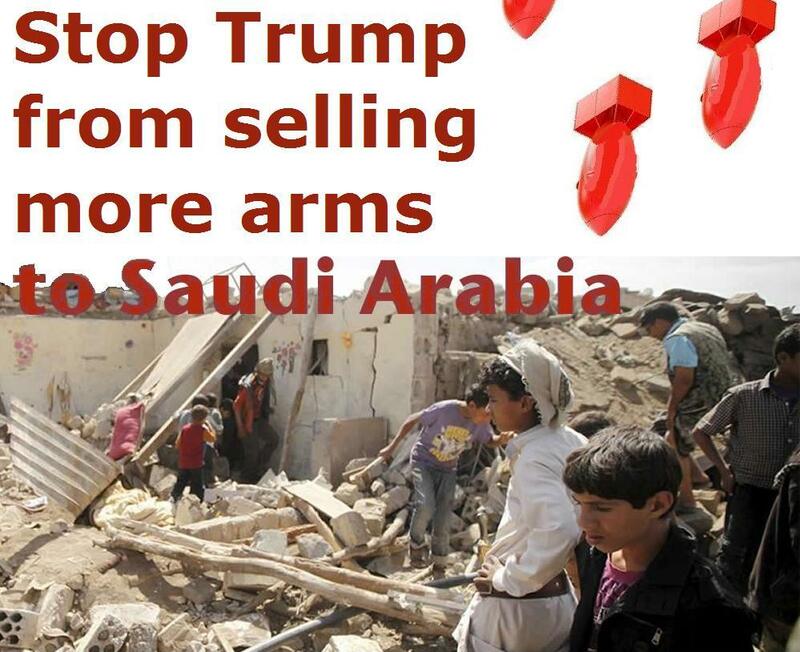 Tell Trump to STOP THIS CARNAGE, not fuel it! Click here. Click here to sign a petition, to put an end to the sanctions against Syria - their only effect is to take a terrible toll on the population, causing them to migrate! And click here to see the video by the Italian Committee to lift sanctions against Syria. Write your senators and tell them: "Enough! U.S. out!! Iraq has shown it can curb ISIS by itself!"